Dogs are not rehomed directly from the pound for obvious reasons, but occasionally a dog needs some extra TLC in a foster home before moving on. These are sometimes puppies, or older dogs, or perhaps dogs needing some medical care before they can be rehomed. Our experienced foster carers offer a stable and loving home, offering the dog the chance to be assessed through all manner of new experiences. Whilst in foster care all dogs are spayed or neutered (if not already done), vaccinated, wormed and flea treated. When we and the carer are satisfied that the dog is ready, it is rehomed through Rochdale Dog Rescue, to families meeting our homing criteria. Click the images to read more about some of these lucky dogs below. Most faced being put to sleep at the end of their required 7 days in the pound. Don't their faces show just how happy they now are with their devoted new owners? 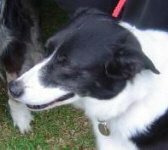 This is MABEL, a lovely Collie girl. Mabel earned frequent flyer points at the pound, being a regular visitor. The last time though she was not claimed before her 7 days were up. Read how Mabel landed on her paws with the home of a lifetime. It is with much sadness that we report that Mabel has sadly now passed away. 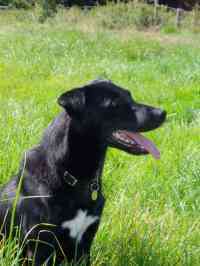 This is KENNY, a crossbreed, possibly a Labrador x Collie. After Kenny's 7 days in the pound he went into foster care with Lindsey. Kenny had a great time playing with Teddy, well actually he was Teddy's play machine! 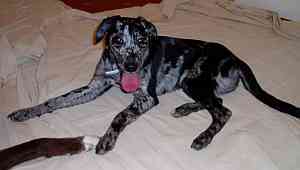 Kenny eventually found the most wonderful home and his new family found out that Kenny is a "splosher". This is HATTY, a Labrador/Staffie Cross. After Hatty's 7 days in the pound she went into foster care with Lindsey. She went through quite a large operation to have some mammary tumours removed but she proved to be a fighter and showed herself to be vocal, playful, lively and waggy and had the time of her life while in foster. She eventually found a wonderful forever home. It is with much sadness that we report that Hatty has sadly now passed away. 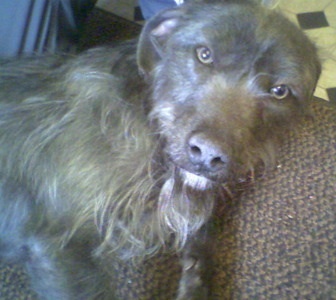 This is LILLIAN, she was picked up by the Dog Warden, taken to the pound and never claimed. 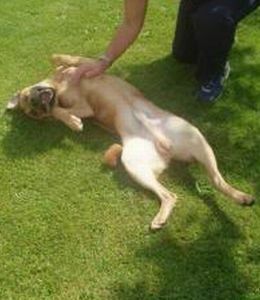 After her 7 days in the pound she came to us at Rochdale Dog Rescue and went into a foster home with Lindsey. She was very thin and had a severe flea allergy. 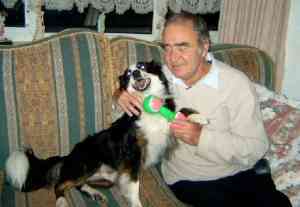 Lillian found her forever home with a lovely gentleman called John, who fell in love with her. 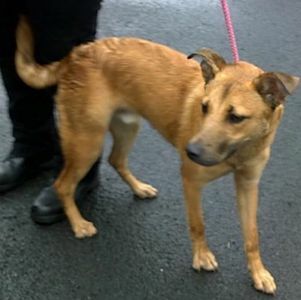 This is GEM, she was another dog picked up by the Dog Warden and never claimed. 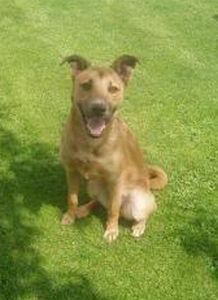 After her 7 days in the pound she came to us at Rochdale Dog Rescue and went into a foster home with Lindsey. Gem was meant to be officially put up for adoption after her visit to the vets to be vaccinated and spayed but fate stepped in. Click the image to read more! 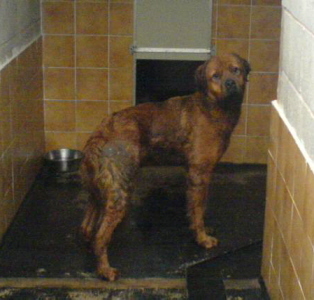 He arrived at the pound bedraggled, thin and not looking at all like the stunning boy he turned out to be under all that grime. 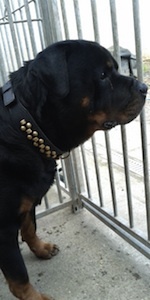 Read how Handsome Harry recovered in foster care before moving to his wonderful new home. FAYTH spent a night with the Dog Warden before being delivered to the pound. She was barely a year old and in need of some weight gain, so moved into foster care with Lindsey, where she quickly showed what a fabulous girl she was. BRIGGS had run out of time at another pound. He was due to be PTS and we were able to help him at the 11th hour. He came into our care and proved himself to be a lovely boy. He is know known as Gyp and is very happy with his new family. GUCCHI had also run out of time at another pound. 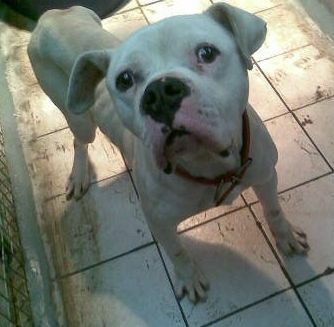 He was found abandoned in an empty house and taken by the dog warden to the pound. No one wanted him and due to lack of space and more and more dogs coming into the pound his time ran out and he was due to be PTS. We were contacted by an organisation similar to RDR who helped find safe places for dogs at this pound and we were able to help him! He is now known as Archie and is very happy in his new home. 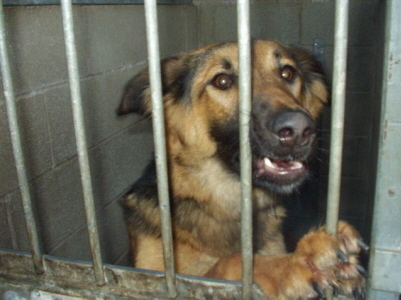 KAISER came to us from the pound after his owner could no longer keep him. 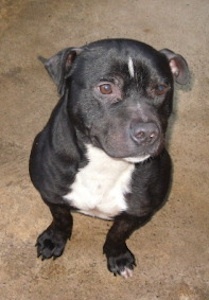 He came into our boarding care to look for a rescue space or home after a change in his owners circumstances. It was soon apparent he was missing home life and he became depressed and down. Luckily one of our volunteers took a real shine to him and the rest is history! Here are some more dogs helped by Rochdale Dog Rescue all of whom faced being put to sleep after their 7 days. These dogs include those who got a rescue place and were rehomed by the great rescues we work with - again all now happy in their new homes! This is lovely Lacey, who after an aventurous trip to rescue where she managed to escape en route she was rehomed by one of our volunteers who had fallen for her! 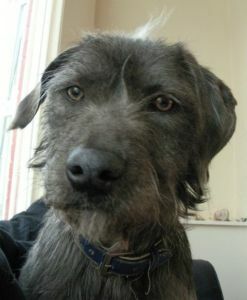 This is Bri aka Bryn, who was also rehomed by one of our volunteers who fell for him as soon as she saw him! As you can see he is very happy in his new home.